A familiar refrain from my ninth grade students, especially when they are asked to do homework, is “I can’t wait until I’m 18, so I can do WHATEVER I WANT.” It’s a natural reaction from a 14-year-old, who is feeling a deep need for independence and control while lacking the life experience to know that we never get to do exactly what we want. As the adult in the situation, it’s best to acknowledge their frustration, gently explain why homework is a necessary evil, and distract them with another task. We feel bemused by kids thinking that they can do whatever they want when they reach adulthood because we know it doesn’t exactly work that way. Yes, we can choose which career we want to pursue, but we quickly learn that our hard-earned money has to pay rent and groceries, or we end up homeless and hungry. Sure, we can choose to never write an essay again only to be assigned the adult homework of job applications and tax returns, and the consequences for neglecting those tasks are scarier than a zero in the gradebook. Part of becoming a grown-up is the acceptance that our freedoms in life are tempered by responsibilities. Then why do we think that it will be somehow different when it comes to food? One of the most common questions from people contemplating intermittent fasting is “Can I really eat WHATEVER I WANT?” Sometimes the question is innocent enough. After years of dieting, some people are marveling at the notion of eating a piece of bread again. But often the question is delivered with an air of defiance and challenge. Some people, burned by years of struggle with the insane rules of the latest diet, are looking to shoot down IF before they even start. Successful IF-ers often claim to eat “whatever they want”, and that simply seems too good to be true. So, can you truly eat whatever you want if you adhere to a daily fast? Yes. And no. At the height of my dysfunctional eating, I was accidentally doing a fasting protocol of sorts. I rarely ate breakfast, and I didn’t eat lunch because I didn’t want to eat in front of others, but every night was a gluttonous binge. I stopped at a grocery store every night, then bought and consumed lots of food in a concentrated amount of time. I ate candy and chips, meat and pasta, cookies, cupcakes, and ice cream. Can you lose weight eating ALL those foods on a daily basis? Absolutely not. The more pressing question is “Why would we want to eat that way?” The idea of eating whatever we want whenever we want has a certain appeal, but it’s not true freedom. True freedom from food is finding a balance between eating the foods we really love while accepting responsibility for the amazing machines that our bodies are. Just like we have to balance our budgets by paying our bills before buying the latest gadget we’ve been coveting, we have to nourish our bodies with a variety of healthy foods while also enjoying the treats that make our lives fun and celebratory. The good news is there is no need for meticulous accounting, just taking a grownup approach to food as we do with so many other desires and needs in our lives. Do we need to eat Brussel sprouts because the latest article called them a superfood? No, but we should probably eat some foods that have vitamins and antioxidants. Can we have a cookie as a reward at the end of a tough day? Sure, but eating the whole package wouldn’t feel good, and we deserve better than that. These days I eat some ice cream for dessert if I want it, but only after a healthful meal with all the food groups represented. I don’t deny myself any particular thing, but I no longer confuse a life without limits with a life that is free. 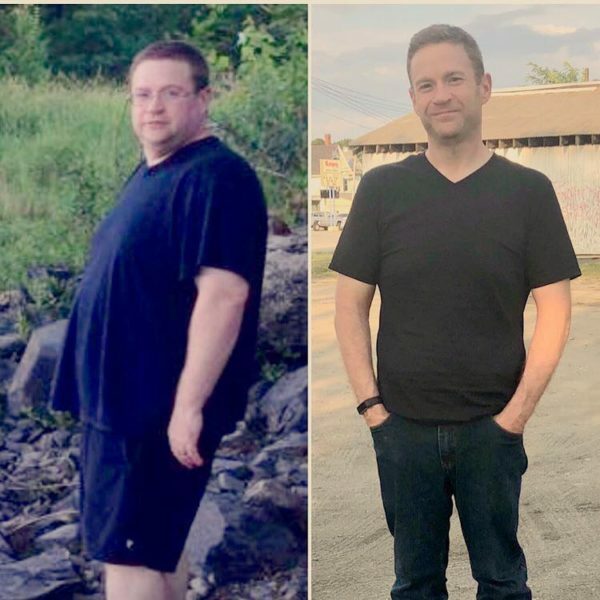 The whole story of our 200-lb weight loss journey is in our book, Unbelievable Freedom: How We Transformed Our Health and Happiness With Intermittent Fasting, available on Amazon using the link below.